Our friends over at Allpar have been talking about the Ram 1500 getting a new 60/40 split tailgate for many moons but this morning, FCA’s truck brand finally introduced their new multifunction tailgate. As you can see in the images here, this new tailgate offers swing-out function for easier access to the bed contents, but it still functions like a traditional swing-down tailgate and best of all, every configuration is trailer friendly. 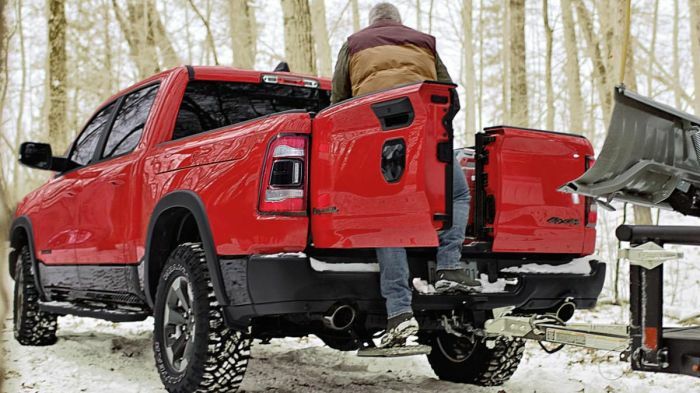 The new multifunction tailgate will begin reaching dealerships during the second quarter of this year and when it arrives, the Ram 1500 will offer easier access to the cargo area. As you can see in the picture above, the tailgate opens like the passenger’s doors, swinging out to 88 degrees and making it easier to reach the items in the bed by removing the distance created by the swing-down tailgate. Rather than opening the tailgate downwards and reaching over it to pull something out of the bed, you swing the door to the side, making removing smaller items quick and easy. At the same time, this tailgate still functions like a traditional unit, swinging down in one piece like every other Ram truck sold over the past few decades. Finally, the 2019 Ram 1500 can be equipped with an under-body bed step that makes climbing into the bed easier when the tailgate is open in its “door” formation. The new Ram 1500 multifunction tailgate is controlled by the basic handle, with the button on the top of the handle assembly providing the traditional swing-down while a button along the bottom of the assembly opens the left-side door. The right-side door opens by means of a handle mounted in the jamb area. The GMC Sierra was the first model full-sized truck to roll out a fancy tailgate that offers easier access to the bed, but there is an interesting shortcoming to that design. The way that it folds down allows it to hit the trailer hitch, so you cannot use the advanced design when you have a trailer hooked up or when you have a hitch in the receiver. On the other hand, the Ram multifunction tailgate will work in every configuration with a trailer hooked up. With some larger SUVs with a one-piece swing-out tailgate, you cannot comfortably access the cargo area with a trailer connected, but the 60/40 doors of the Ram 1500 are short enough that they don’t interfere with the trailer. Even the available bed step will work with a trailer connected, so the new Ram multifunction tailgate is a great option for someone who frequently pulls a trailer while also using the bed. This feature will be offered on all trim levels of the 2019 Ram 1500 with the tailgate itself costing $995 while the optional bed step costs $295.